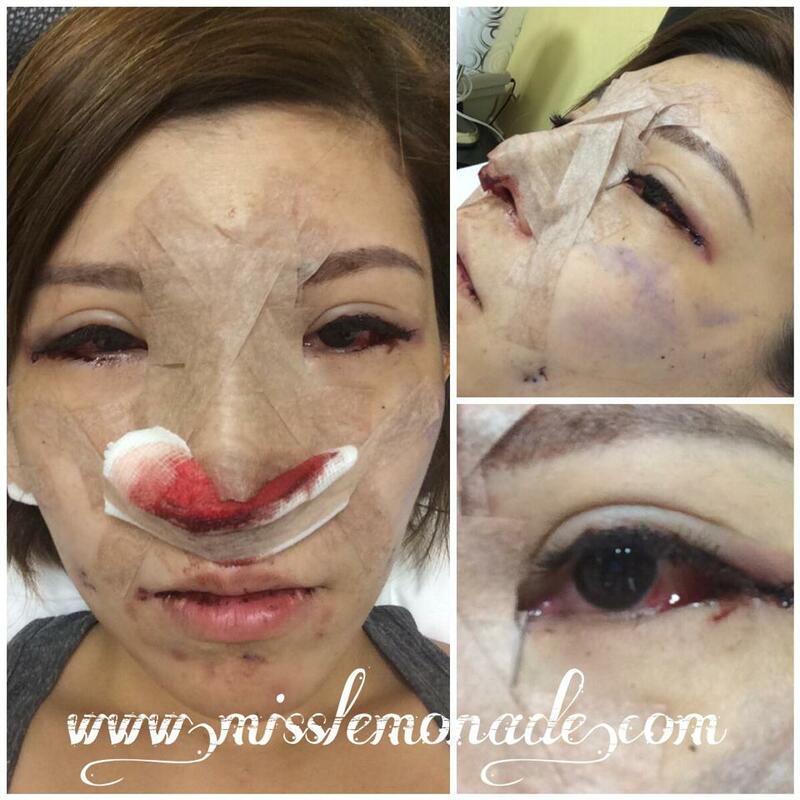 Warning: This blogpost contains some graphic images of the aftermath of plastic surgery. I’ve interviewed many people for this blog – from celebrities to millionaires and young entrepreneurs. So why not bloggers too? 😀 I had many questions for Miss Lemonade, a Singaporean blogger who blogs mainly about plastic surgery – what a niche! I wanted to know if she thinks [insert name of celebrity blogger] had plastic surgery (she confirmed my suspicions! ), how sponsorships work, how she makes money from her blog, and so much more! I got to know Emmeline, a.k.a Miss Lemonade, at a spa’s launch event. The only reason I kept in touch with her was because she made a great first impression on me. ‘Glam’ would be my description of her outfit that day, and she looked very pretty sitting there in the waiting area. I did not expect her to be so friendly. So I ‘liked’ her facebook page and was kept updated about her plastic surgery adventures, or what she calls ‘beauty trips’. Emmeline helped open my eyes (pun intended!) to the world of plastic surgery, why it’s so addictive, why some people kill themselves after the surgery, and what many people don’t know about before signing up for their first surgery. 1) First up, share with us how your blog name, Miss Lemonade, came about. I used to love drinking lemonade. And when I couldn’t think of a good blog name, I settled for Miss Lemonade. 2) Why did you sell your LV bag to pay for surgery? I bought that first LV bag with my bonus from work. I had been thinking about getting eyelid surgery for years but never took the next step because I didn’t have the money. One day, I thought that I just had to start somewhere, so I sold the bag, and booked that appointment. Now, I book my air ticket in advance, and every month, I’ll convert some of my pay to the required currency (where my surgery will happen). No more procrastination. 3) How do sponsorships work for you? Do you get paid too? This year alone, I’ve received about 20K in sponsored surgeries. I don’t get paid for writing the blogposts but I earn commissions for referrals from my blog. Yes, there’s no way of tracking whether the hospitals pay me the right amount of commissions but I have a full-time job so this is a nice side income. 4) Why is plastic surgery so addictive? First you change your nose. Then you think about changing your eyes to match your new nose. And then you feel something is still ‘missing’, and you go about changing that nose again or another facial feature. And this ends up becoming an addiction. Your mindset must be right. Be responsible to yourself: know what you are doing and why you need to do this. Is it necessary? Will it improve anything? 5) Do you feel the same inside, despite the multiple surgeries? I’m still me. But my character has changed for the better. I am happier, more confident and if I had stayed as the previous ‘me’, I would not have grown. In the past, I used to be fearful of even asking strangers for directions. I had to take that first step. I can fail but I must not give up. 6) Any horror stories to share regarding plastic surgery? 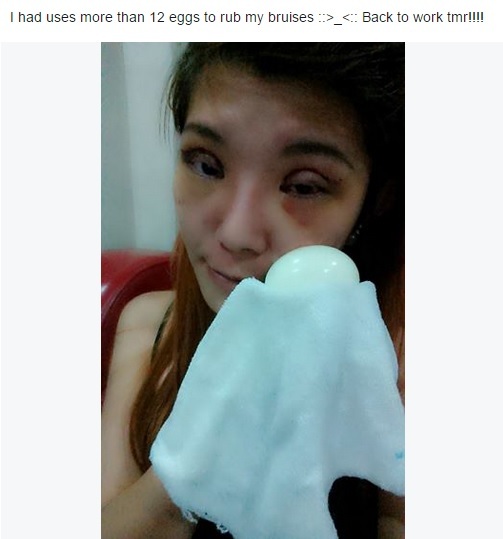 For my first eyelid surgery, I read reviews on a forum which said that a particular Thai doctor was good. I went to Thailand, located the clinic, and found it to be rundown and dirty-looking. But I decided to just give the doctor a chance based on the positive reviews. The doctor did not listen to me, for one. And I felt a sharp pain in the middle of the surgery (maybe the anesthetic had worn off). My whole face swelled up and my eyes looked scary. After two years, my eyelids still looked as if they had just been ‘cut’. But it was my first time going for plastic surgery. I had no prior experience and just popped into that clinic based on reviews. The bandage can only be removed after 7 days so you cannot wash your face. You can’t wash your hair too unless it is done in a salon. If water gets in, you risk getting an infection. Yes, the skin under the bandage will itch so you’ll have to scratch gently. 7) Is that bad experience the reason why you are blogging about plastic surgery now? Yes. There is very little information on forums. Those with experience don’t share much, so I’m helping those with zero knowledge get the information they require before going for their first surgery. 8) Will you go for more surgeries? What if you strike the lottery now and suddenly have a lot of spare cash? I won’t do more surgeries. The money will be put to better use for my kid’s education. I’ll still need the maintenance work such as fat grafting though. As we age, we lose facial fat. 9) Which surgery was most memorable for you? After my first nosejob, I teared in front of the doctor. Before that, I had no nose bridge, my nostrils were very wide, and I didn’t expect much change after the surgery. But my looks definitely started to change after I got my new nose. 10) Any advice for people going for their first beauty trip? If you are below the age of 23, it is likely that you still do not know exactly what you want. Many bloggers go for plastic surgery and many girls want to go with this ‘trend’. However, they don’t know if they can deal with the outcome. Many ladies go for plastic surgery because of what their friends have experienced, or due to influences from the media and from watching amazing transformations in TV programs. What they do not know is that these TV programs show the ‘before and after’ but not the 9 months in-between! When your face starts swelling beyond recognition, you just might be unable to accept it. A girl in Korea committed suicide because of this reason! Dealing with the downtime is not easy. Most people don’t know what to expect and when your face is swollen, you will start asking “What am I doing to myself? !” It is really not about the surgery or the recovery… it is about the downtime. Can you accept it? You’ll be looking weird for six months to a year. Can you accept what other people are saying or thinking as they look at you? Most people think that the swelling will last for only 2 weeks. But there will be micro swelling for six months to a year, before you get your ‘final look’. My nose is a bit slanted now because of the micro swelling. But I will not blame the doctor. I’ll give it the time it needs, and see the final result before I make any judgments. So go to a few clinics and talk to the doctors. If you feel good about the clinic and service, then proceed with the surgery. Don’t blame the bloggers if something goes awry – what worked well for them may not work well for you. In Korea, depending on which hospital you select, there is usually a 1 to 2 year warranty period for the procedures. So you can return to fix anything that doesn’t look right. 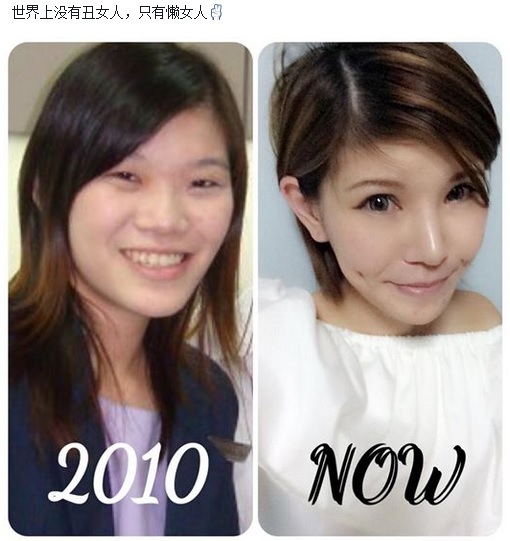 One of my readers became really gorgeous after her nose job but went and removed the silicon after because though she looked more beautiful, people could tell that her nose had been surgically enhanced. If you want a natural-looking, no-trace-of-surgery look, don’t go for plastic surgery. It’s not going to happen. Like Emmeline, I do my best to present to my readers as objective a review as possible. Even when I am paid to review a product, I like to be upfront and honest about what is great about the product and what improvements can be made to it. I’m in my 5th year of blogging now, and I know I have a responsibility towards my readers, and that with every blogpost I put out, my credibility is at stake. Even when I conduct interviews with inspiring individuals, and a (trusted) reader tells me about something this interviewee has been doing that is not legal, ethical or moral, I will remove that interview blogpost. 1) To be honest, brave and unafraid of showing the less-than-glam side of you. Bruised eyes, bleeding nose, battered face? No worries. There is no need to be photoshopped or airbrushed to perfection, because that won’t be the real you. 2) To connect with readers, and be a genuine person. I do look forward to forging relationships with my loyal readers, and I am pleased that I’m friends with some of them. They have my mobile number and we chat via Whatsapp too. Over time, these fans have become my friends and we trade beauty secrets and makan recommendations outside of the blogosphere. 🙂 Though I’ve yet to go on any overseas trips with my readers, I do look forward to the day when I may have that opportunity. 3) To be humble and approachable no matter how famous / successful / pretty you are. One can be pretty on the outside but ugly inside. So, yes, I’m deathly afraid of surgery and therefore cannot ‘enhance’ my looks, but I can (and will) work on cultivating inner beauty. Having blogged for 5 years now, I do occasionally fall into the trap of thinking that I’m better than someone else. But deep down, I know that’s not true. Every individual has his own failures and successes, fears and strengths. That is why this blog was started as an interview blog, in which I can seek out and learn from inspiring individuals because every single person has something interesting to share – it could be a lesson, an experience, a mistake, a failure, a triumph, a fear, a struggle? This entry was posted in Beauty, Blogging, Fellow Bloggers and tagged bloggers who did plastic surgery, dimple creation, double eyelid surgery korea, fat graft, miss lemonade, plastic surgery, plastic surgery blogger, plastic surgery in thailand by Grace Tan. Bookmark the permalink. Yours is one I have bookmarked since then on…(which I rarely do haha!) but seriously you are an amazing woman, full of inspiration. Thanks and keep the fire burning. I hope to meet you one day! Thanks, CharlesAngel. 🙂 Cya then! For the third time after reading this, still I salute her for being honest and brave.